How does Radbot save me money, make me comfortable, and cut my carbon footprint? A live demo in your browser showing how this simple smart tech keeps you warm and saves money. Go to Vestemi.com to find out more about Radbot, the consumer version of OpenTRV. There are four houses shown in the demo; one large and three small. You can click on one of the small houses to swap it with the big one. The houses are built the same, and have the same radiators and boiler. There are four rooms in each house. You can click on one of the rooms in the big house to move the person into it, and they'll move in all houses. The room colour shows how warm the room is. The rooms start off cold because it's cold outside. There is a 'Reset' button to move everything back to the beginning. There is an 'Upgrade Valves' button to upgrade the big house to be one with better heating controls, right up to the best 'Radbot+' house. In each room there is a radiator. In one room in each house there is a boiler, and when it is running a flame is visible at the bottom. All the time it is running, it is burning gas (and money), so ideally it should run as little as possible without the person being too cold or too hot. In another room in each house except for the 'best' one (Radbot+), there is a house thermostat on the wall. The boiler will run until the room with the thermostat in it is warm enough. With Radbot+ the boiler runs until whichever room the person is in is warm enough. 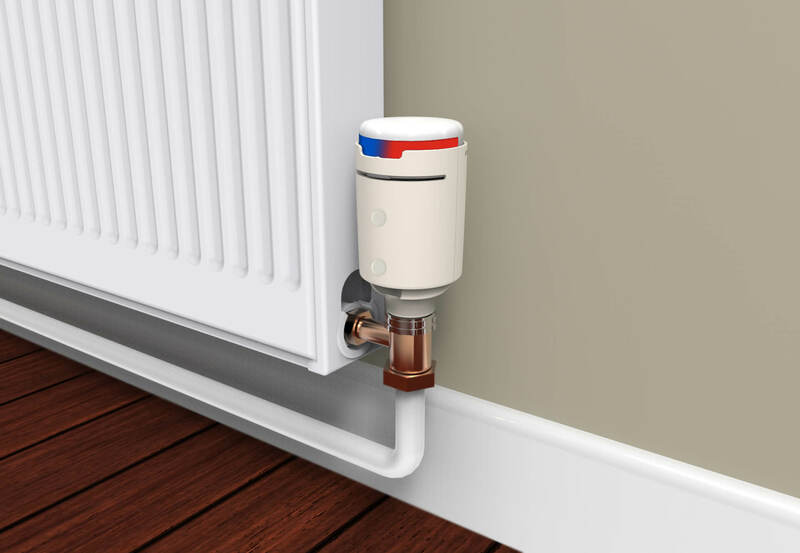 This house has old-style non-thermostatic radiator valves that need 'balancing', and that you turn up to try to get heat into a room faster, and that can't stop the room overheating or provide automatic frost protection. This type of valve wastes a lot of energy and needs more tinkering with as the weather changes to keep the room at a good temperature. The boiler comes on when the room with the house thermostat gets cold. In any room except the one with the thermostat the person may get too hot or too cold and stay that way! Lots of houses in the UK are still like this. In this house the person has the least control and comfort, and is wasting probably much more than half the money that they're spending on gas trying to stay comfortable. This house has mechanical thermostatic radiator valves (TRVs) on all the radiators, which when used correctly help maintain a steady room temperature without tinkering, and the temperature can be adjusted separately for each room, eg to be cooler in the bedrooms than other rooms. When used correctly TRVs can prevent uncomfortable overheating (saving a lot of energy and money) and provide frost protection too for less-used rooms without having to them fully. In this house the person has more comfort and less cost, but may still find it hard to get warm enough in most rooms, and they may also find it hard to avoid heating rooms they're not using. Why heat the bedroom when they're in the living room? In this house the mechanical TRVs have been replaced with Radbot. Radbot is a smart TRV with Artificial Intelligence and can tell when someone is in the room or not, and can remember what times of day the room is generally in use or not. Radbot can prevent overheating, provide frost protection, and allow separate temperatures for each room, but also automatically cuts the heat in empty rooms, and can start to bring rooms back to temperature just before the person wants to use them. Radbot used like this can save a third of the energy and cash used to heat rooms compared to mechanical TRVs in the second 'Thermostatic' house. The person shouldn't even need to set the boiler clock, and has saved money without being any colder than they were before, because Radbot is looking out for them! In this house the mechanical TRVs have been replaced with Radbot, and the house thermostat has also been replaced with Radbot's boiler controller. Now the boiler only runs when one of the Radbots knows that its room needs heat. Not only does this save running the boiler unless needed, it also means that Radbot can remotely ask for heat whichever room the person is in, not just the one where the house thermostat used to be. When set up this way the house should only cost half to heat compared to the second 'Thermostatic' house, and the savings over 'No valves' house are even larger. So the person saves more money, spends less time too hot or too cold, and the heating system works better for them. Cost, comfort, control. Components copied from https://github.com/opentrv/openTRVDemo, and moved to various places on the Web server filesystem. Forked from https://github.com/hif2k1/openTRVDemo (thank you Hamish F!). Radbot is a robot for rads that could reduce heating costs by 30 percent. First published 2017-05-09 , updated 2019-04-18 , rebuilt 2019-04-23 . Site copyright © 2007-2019 Damon Hart-Davis. Hosted by ExNet.